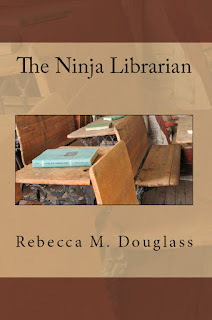 The Ninja Librarian: Middle Grades + A Kindle Giveaway. YES, JUST IN CASE YOU HAVEN'T SEEN IT HERE YET! Download the e-book, find the secret phrase, and enter it into the contest link embedded in the e-book. You'll be entered into the drawing to win a Kindle Fire, a $10 Amazon Gift Card or a great middle grade e-book from one of 14 fantastic authors, representing 5 countries and 3 species (now you have to read it, don't you?). Competition opens 7 February 2013 and the winner will be announced on 14 February 2013. This e-book will be available to download for free for 5 days from the 7th to the 11th of February, and at 99c for the remaining days of the promotion. The winners will be drawn on 14 February 2013 and announced shortly thereafter. Whether you like fantasy, adventure, mystery, horses, or humor, Love Middle Grade, Actually gives you a taste of it all! TO GAIN MORE ENTRIES, BE SURE TO HOP ON OVER TO FOLLOW ANY OF US ON TWITTER, LIKE US ON FACEBOOK OR TWEET ABOUT THE GIVEAWAY. Be sure to add those of our books you love (all of them, right?!) to your wish lists and to-read lists! Naturally, mine is one of the books--and I'm very excited to be part of this promotion. Here is my book cover, just in case you missed it the first time. Get the original Ninja Librarian before the sequel comes out--it's only a matter of weeks!